This card is a great card to be used for any occasion. I used "Thank You" as the greeting, but you could have used it for Birthday, Get Well Soon, or not have put any greeting at all. This card is primarily made of Ginger Blossom Designer Series Paper and using the Boho Blossoms punch. Stamp large swirl (Baroque Motif stampset) with River Rock ink onto River Rock card front (upper area). Cut 3x4.25" piece of Designer Series Paper (Ginger Blossom). Wrap ribbon and buckle across front (adhere to back). Adhere the whole piece down to card front. Stamp and assemble greeting and layered pieces. Punch flowers using Boho Blossoms punch and Ginger Blossom Designer Series paper. Tape flowers centers onto large flower, then punch center. Place brad through the center of each flower. 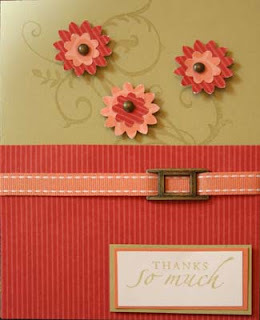 Adhere each flower with stampin' dimensional.